Here’s how to make Thai Sweet Chili Sauce that’s completely Sugar Free and Starch Free! That’s right! This recipe does not use any sugar whatsoever! It thickens up and gets sticky when heated, it’s sweet and spicy, just like it should be! You can use this sugar free sweet chili sauce and cook it down with any meals or you can use it as a dipping sauce. 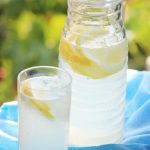 In Japan, we don’t have many liquid sweeteners available so I couldn’t come up with a recipe using those. That’s when I came across Mellissa’s recipe for Sweet Chili Dipping Sauce as she uses orange marmalade which I thought was absolutely genius! Marmalade has the same consistency as honey and thickens up nicely when heated so it was a perfect match! I added a few ingredients to make it more red in colour, more spicy and taste a bit more like the one they sell in Japan! I can’t wait to make something like egg rolls and dip it in this amazing sugar free sweet chili sauce! Making this Thai Sweet Chili Sauce is incredibly easy. You don’t need any special equipment and you don’t need to cook it down. Add all of the ingredients in a bowl and you just need to mix everything together! How easy is that? 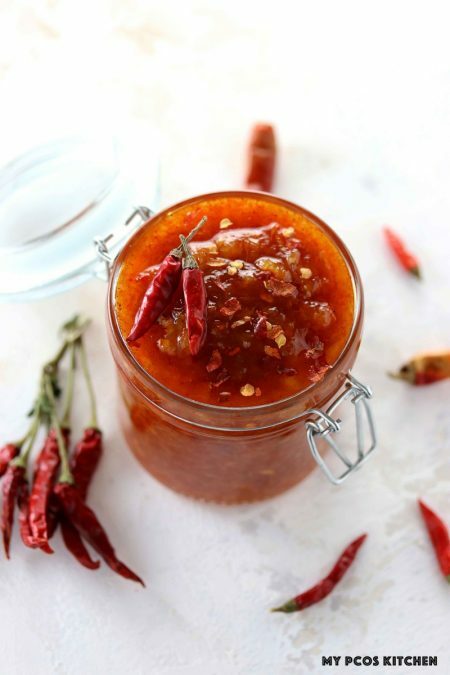 Make this homemade sweet chili sauce and you’re set for any kind of Asian dish! For the orange marmalade, make sure you use some that’s completely sugar free! Some have hidden fake sugars like aspartame, maltodextrin or sucralose so you really do have to look in the ingredients to see what they are. The one I found in Japan only had orange juice, peel, lemon and pectin with no sugar added! I make a big batch of this sauce and add it to a glass pickling jar that I keep in the fridge. Since it uses orange marmalade, it does tend to keep a while. You don’t need to add a lot, depending on what you’re making of course, and the best trick I have for you is to let it cook down with your protein and veggies. The longer it cooks, the thicker and stickier the sauce gets. Feel free to add more chili pepper flakes or chili oil to this recipe if you think that it’s not spicy enough. Depending on the dish I’m making, I may or may not add a tsp of pepper flakes to the recipe. 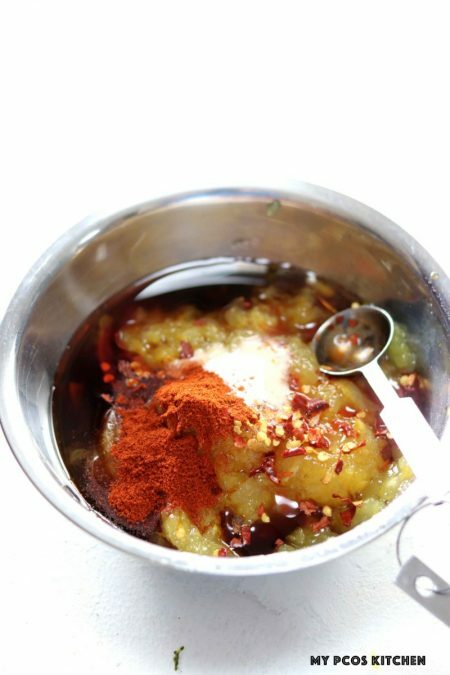 I have been using this sweet chili sauce recipe to make different Asian dishes for a while now! 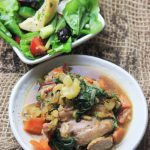 You can check out my recipe for Sweet Chili Chicken which uses my Paleo Fried Chicken and this sauce. I’ve also made it with some shrimp and veggies, which I’ll upload the recipe a bit later this month. You can coat some shrimp with my Keto Tempura batter and cook the shrimp tempura down with this sauce! You can coat baked chicken wings, pour it over baked salmon, or even use it as a dipping sauce for egg rolls and the likes! If you eat paleo, dip some sweet potatoes in there and you will have your mind completely blown! 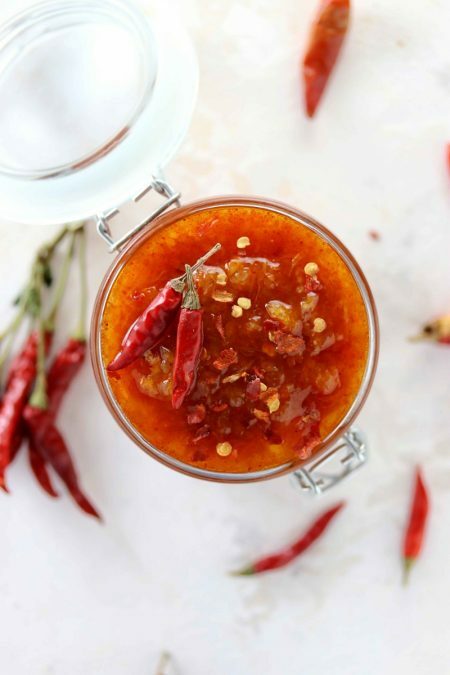 Now that you know how to make Thai Sweet Chili Sauce, what dishes will you make with it? A delicious sticky sauce with no added sugar or starch! Add all of the ingredients into a bowl and mix together with a whisk or fork. The sauce is now ready to be added to any dish. Keep in a Tupperware in the fridge for 3-4 weeks. Where exactly do you find sugar free marmalade?? Anything ‘sugar free’ that I find has aspartame & other poisonous crap in it. A link to those things would be most helpful. My husband has fish allergies. If I omit the fish sauce, will it make a huge difference in the flavor. Or is there something I could use in its place? Thanks. It shoudn’t make that much of a difference, but you could use Worcestershire sauce (does that have fish?) or soy sauce/coconut aminos/liquid aminos with a splash to lime juice. so these are only 2 net carbs ? Hi Ashanty, it’s about 2g net carbs per tablespoon and you would add as many tablespoons as you need in whatever you’re cooking! Is this sauce suitable for use in a chilli chicken and veg stir fry? Is there a way to omit some of the items that are spicy. My husband and I use to enjoy spicy things but with age we can’t handle it. I want to make these wings so bad. Please help. If I could drive where you are I would give you the BIGGEST hug EVERRRR! I made lumpia with low carb wraps and made this sauce. It almost brought a tear to my eye. I woke up the next day thinking of all of the amazing things I could make with this unicorn sauce and wings instantly came to mind *drool alert* They were spectacular. Thank you so much for sharing! What type of sugar free marmalade do you use? Do you make it or is it store bought? Thank you. I can’t wait to make it. Hi Sharon, I use a store bought one. It only has orange and pectin, nothing else. But it’s a brand in Japan so am not sure of the brands you have in your country. Hi! Could you post the name of it? 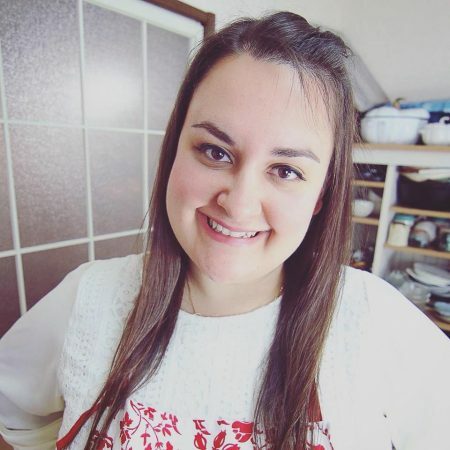 I also live in Japan and would love to know what brand it is when I go shopping this week! Hi Tara it’s from the アワハタ brand name. They have lots of jams without sugars. Sweet chili sauce is so delicious! I haven’t seen one with less sugar, so this is super exciting! 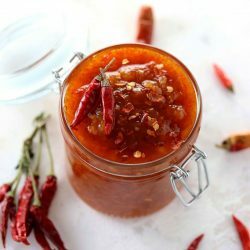 I love Thai Sweet Chili Sauce, but never thought about making my own! Thank you for sharing, will give it a try! My husband would LOVE this sweet chili sauce. He is all about spicy things (which I can’t seem to handle lol) but he loves all things hot. Looks so yummy!! I love that you included coconut aminos! That stuff can do anything!! Oh wow, I’ve always wanted to make it and it’s easier than I thought! condiments are always a tricky thing on special diets…and this is one of THE best ones to have an alternative to, thanks!! Love this! So much cleaner than the store bought version and I bet it tastes better as well. I love the idea of making your own thai sweet chili sauce! The store-bought versions often contain so much sugar and other undesirable ingredients. This sauce looks so good and better yet, no sugar! The use of marmalade is brilliant! And so simple! 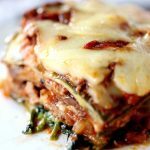 No cooking and reducing – I will be making this one for sure! Oh man that looks so good! I will be trying this for sure – we have stir fry night at least once a week! Thanks! Oh gosh. I want to pour this sauce on everything! Oh wow, I bet this does make some awesome chicken wings! I did just that last night. OHH EMMM GEEE! AMAZEBALLS!!! It’s always great to see a recipe made without sugar! I think that, as a society, we eat far too much of it! Your sauce looks delicious! LOVE that this is sweetened with stevia! Definitely going to make because we LOVE Thai chili sauce, but I refuse to buy it when it’s full of sugar!